Senior Airman Heather Perez, 108th Security Forces Squadron, climbs aboard a 108th Wing KC-135R Stratotanker on July 12 at Joint Base McGuire-Dix-Lakehurst. More than 25 Airmen from the 108th Wing's Security Force Squadron deployed July 12, for a six-month tour in Southwest Asia in support of Operation New Dawn. Amid family members and senior leadership from the 108th Wing and New Jersey Air National Guard, the 108th Airmen said goodbye to their loved ones during a farewell ceremony held at the Wing's conference room here. Senior Airman Omar J. Navarro, a Newark resident and recent college graduate, said he was a little nervous about the deployment, but he was also excited at the opportunity. "My sister and mother have both been deployed to Afghanistan and Iraq and they told me I would be alright," said Navarro. "My father is a nervous wreck, though." After a couple of weeks of training in Nevada to hone their security forces skills, the Airmen will deploy to Southwest Asia to commence the mission. The 108th Airmen are well-equipped and well-prepared to accomplish their mission, said Col. Robert A. Meyer, 108th Wing vice commander. Maj. Gen. Maria Falca-Dodson, commander of the New Jersey Air National Guard, told family members that they should be proud of their Airmen for serving in the military. 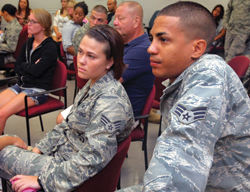 Senior Airmen Omar J. Navarro, right, and Lauren Drennan listen as Maj. Gen. Maria Falca-Dodson, commander of the New Jersey Air National Guard, addresses the deploying Security Forces Airmen and their families. "They are American heroes," said Falca-Dodson. "Less than one percent of the population in the United States serves in the military and these are some of them." 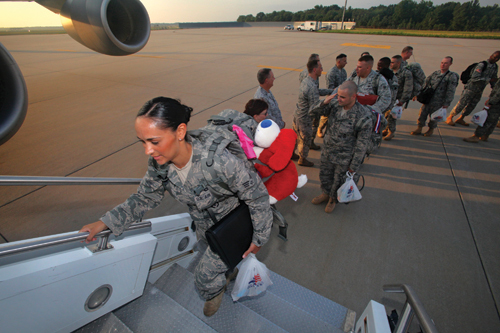 During their deployment, the Airmen will conduct air base ground defense missions, which may include perimeter patrols, flight line security, vehicle searches, and processing personnel at base entry points.